By Cognilytica. Discovered by Player FM and our community — copyright is owned by the publisher, not Player FM, and audio streamed directly from their servers. 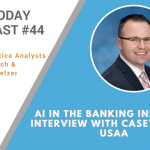 AI is seeing increasing adoption across a wide range of industries, and banking is no exception. Founded in 1922, USAA is a Texas-based Fortune 500 diversified financial services company offering banking, investing, and insurance to people and families who serve, or served, in the United States military, with over 12.4 million members. As a result of their broadly geographically distributed customer base and needs for in-person as well as online and mobile offerings, the company has invested deeply in advanced technologies and is frequently at the forefront of emerging technology. 86 episodes available. A new episode about every 6 days averaging 21 mins duration . Start listening to AI Today Podcast: Artificial Intelligence Insights, Experts, and Opinion on your phone right now with Player FM's free mobile app, the best podcasting experience on both iPhone and Android. Your subcriptions will sync with your account on this website too. Podcast smart and easy with the app that refuses to compromise.